We've got the full scoop on Mark Haggard and Bruce Kimmel's 1976 R-rated musical comedy coming to Blu-ray in November! As previously reported, Kritzerland has revealed they are working on 'The First Nudie Musical: 35th Anniversary Edition' for a Blu-ray release and now the date looks to be November 5. The film starring Stephen Nathan, Cindy Williams and Bruce Kimmel will be mastered from the internegative (unfortunately the original camera negative is lost), however the quality is reportedly "terrific." The Blu-ray will feature 1080p video, a DTS-HD Master Audio Mono soundtrack, and supplements will include: Audio commentary with Cindy Williams, Stephen Nathan and Bruce Kimmel; Audio commentary with Nick Redman and Bruce Kimmel; Retrospective documentary with audio commentary featuring Nick Redman, Michael Rosendale, and Bruce Kimmel; Deleted scene; Two deleted musical numbers (one audio only); Two theatrical trailers and radio spot; Costume tests; and Stills gallery. The first 100 pre-orders at Kritzerland's site will also have their Blu-rays signed by Bruce Kimmel and Cindy Williams. 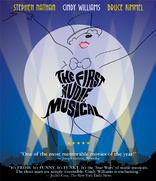 You can find the latest specs for 'The First Nudie Musical: 35th Anniversary Edition' linked from our Blu-ray Release Schedule, where it is indexed under November 5.